I am always on the lookout for unusual and interesting books, from which I hope to learn new ideas. But time becomes an issue, as I have to prioritize which books and articles to read first. About a year ago, I wrote an article about the industry standards for nonfiction books, and why such books all end up looking the same. The conclusion of that article was that instead of chasing speed reading and memorization techniques, it was more important to first select the right books, and read only those. Continuing in my quest to read more and better, about six months ago I came across an idea that is simply mind blowing to me: if you’re reading nonfiction books cover-to-cover, you’re doing it wrong. 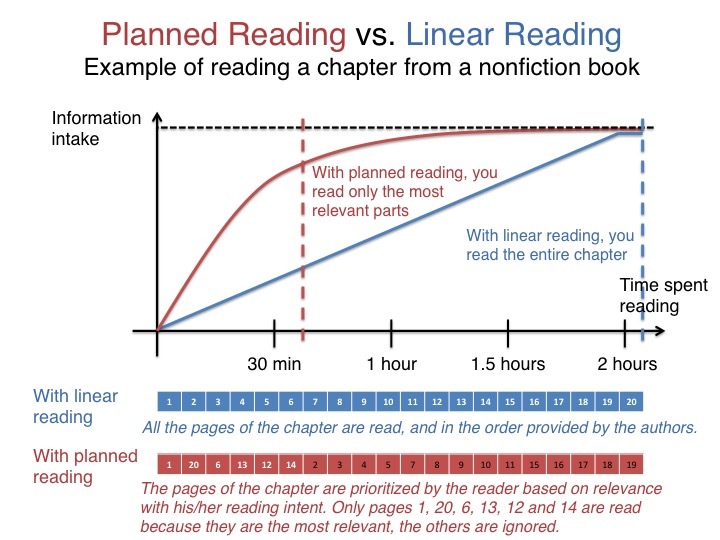 In this article I will talk about a better way to read nonfiction content, called planned reading, which will save you time, will keep you more focused, and will help you retain more from the books you read. Let’s take a shortcut for the sake of simplification, and say we can classify all books into three main categories: technical, fiction, and nonfiction. Technical books and textbooks concentrate all the knowledge about one domain into a single place, and organize that knowledge to make it simple to navigate down to details. Technical books are easy to use: you open a technical book because you have a question, thus you’re going to start at the Table of Contents or at the Index to identify which areas of the book have the knowledge you’re looking for, and you’re going to jump to those pages directly. Fiction books such as novels tell stories, and most likely you’re reading those books for entertainment, thus you’re shouldn’t be fussed to spend time on it, because you enjoy it. Fictions books are easy too, just open the book on the first page, and keep reading until you reach the last page. The authors designed their content linearly in such a way that you get deeper into the story as you keep reading. Stories may be nonlinear, but the delivery structure is linear, i.e. one page after another. Nonfiction books convey ideas and opinions using arguments, examples, anecdotes, data, surveys, etc. The most likely reason why you’re reading those books is because you want to learn about some new concepts or ideas, not because you are enjoying the authors’ style. The authors of nonfiction books present with a linear structure and invite us to follow that structure to get the gist of their ideas. And this is where most of us fail, when the books becomes boring, repetitive, sentences don’t make sense, and rightfully so: most authors of nonfiction are bad writers. If you research a bit into the process that book publishers use to get nonfiction books out the door, you’ll learn that most nonfiction books are just 10-page articles that have been stretched into 250-page books using bad prose and anecdotes. Therefore the structure offered by authors in nonfiction books is a trap, and following it will inevitably lead you to getting bored and dropping out. And if you do manage to finish a 250-page nonfiction book, chances are you spent 20-25 hours on it, and you feel like you wasted most of that time zoning away and being half-distracted. There is a better way to reading nonfiction books that takes less time, leaves you with a more in-depth understanding of the author’s ideas, and keeps you engaged as you read. Enter planned reading. Planned reading relies on two things: your intent for reading a book, and the Pareto principle. Your intent is what makes you want to read that book, what goals you have, what you expect to learn, what insights you want to get, etc. The Pareto principle states that 80% of the effects come from 20% of the causes. Now when you combine the concept of having an intent and the Pareto principle to reading a nonfiction book, this means that a few areas of that book will contain most of the ideas that are relevant to the personal goals you have for reading that book, which I’ll name “relevant areas”. Thus, two people reading the same nonfiction book but with different intents will find different areas to be relevant. Spending as little time as possible on a nonfiction book boils down to building a reading plan so you identify the areas relevant to you, and read those only. Building a plan means that not only you decide what to read first, but also decide what you will ignore and not read. If you read this chapter linearly, from beginning to end, using only the structure provided by the author, your information intake will be linear as well. It is very likely that the anecdotes, examples, and business cases won’t bring much value, but by reading linearly you have to go through them anyway. First, the introduction and conclusion, because the author is likely to introduce his idea and summarize his argument there (p1 and p20). Then the pages with statements about the core idea of the chapter, because this is where the author articulates some arguments to support his idea. (p6 and p13). Finally the pages with the diagram and table, because those are information dense (p12 and p14). This was only to plan the reading of a chapter. When reading a nonfiction book, you would start by looking at the Table of Contents, Table of Figures, Index, Appendixes, to map out what’s in the book. Then you would decide which chapters to read and in what order, and which chapters you would ignore completely. And finally for each chapter you would decide what pages to read, and in which order. Using this technique myself, I have noticed that the simple act of planning my reading, and as I read keeping my intent in mind, helps me stay focused and engaged. I have also noticed that I am able to remember the main ideas and arguments of books more clearly and for longer periods of time. If you want to learn more, I strongly encourage you to read this 10-page booklet by Paul N. Edwards, which expands on the concept of planned reading and offer more tips and ideas. Do you have any reading techniques or tricks that you’ve used for nonfiction books and that’s worth sharing? Write a comment below!